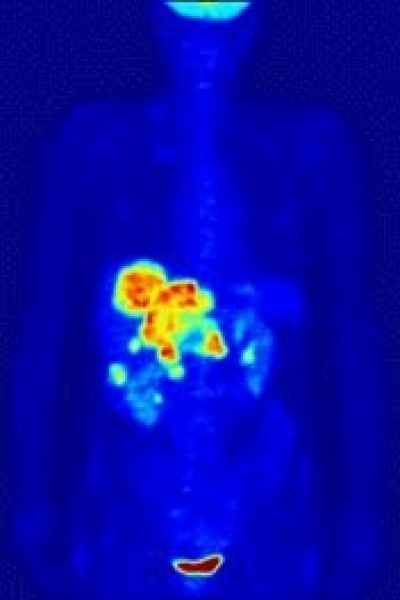 Positron emission tomography (PET) is a nuclear medical imaging technique that produces a three-dimensional image or picture of functional processes in the body. The system detects pairs of gamma rays emitted indirectly by a positron-emitting radionuclide (tracer), which is introduced into the body on a biologically active molecule. Three-dimensional images of tracer concentration within the body are then constructed by computer analysis. In modern scanners, three dimensional imaging is often accomplished with the aid of a CT X-ray scan performed on the patient during the same session, in the same machine. If the biologically active molecule chosen for PET is FDG, an analogue of glucose, the concentrations of tracer imaged will indicate tissue metabolic activity by virtue of the regional glucose uptake. Use of this tracer to explore the possibility of cancer metastasis (i.e., spreading to other sites) is the most common type of PET scan in standard medical care (90% of current scans). However, on a minority basis, many other radiotracers are used in PET to image the tissue concentration of many other types of molecules of interest. To conduct the scan, a short-lived radioactive tracer isotope is injected into the living subject (usually into blood circulation). The tracer is chemically incorporated into a biologically active molecule. There is a waiting period while the active molecule becomes concentrated in tissues of interest; then the subject is placed in the imaging scanner. The molecule most commonly used for this purpose is fluorodeoxyglucose (FDG), a sugar, for which the waiting period is typically an hour. During the scan a record of tissue concentration is made as the tracer decays. As the radioisotope undergoes positron emission decay (also known as positive beta decay), it emits a positron, an antiparticle of the electron with opposite charge. The emitted positron travels in tissue for a short distance (typically less than 1 mm, but dependent on the isotope), during which time it loses kinetic energy, until it decelerates to a point where it can interact with an electron.The encounter annihilates both electron and positron, producing a pair of annihilation (gamma) photons moving in approximately opposite directions. These are detected when they reach a scintillator in the scanning device, creating a burst of light which is detected by photomultiplier tubes or silicon avalanche photodiodes (Si APD). The technique depends on simultaneous or coincident detection of the pair of photons moving in approximately opposite direction (it would be exactly opposite in their center of mass frame, but the scanner has no way to know this, and so has a built-in slight direction-error tolerance). Photons that do not arrive in temporal "pairs" (i.e. within a timing-window of a few nanoseconds) are ignored. The most significant fraction of electron–positron annihilations results in two 511 keV gamma photons being emitted at almost 180 degrees to each other; hence, it is possible to localize their source along a straight line of coincidence (also called the line of response, or LOR). In practice, the LOR has a finite width as the emitted photons are not exactly 180 degrees apart. If the resolving time of the detectors is less than 500 picoseconds rather than about 10 nanoseconds, it is possible to localize the event to a segment of a chord, whose length is determined by the detector timing resolution. As the timing resolution improves, the signal-to-noise ratio (SNR) of the image will improve, requiring fewer events to achieve the same image quality. This technology is not yet common, but it is available on some new systems. A technique much like the reconstruction of computed tomography (CT) and single-photon emission computed tomography (SPECT) data is more commonly used, although the data set collected in PET is much poorer than CT, so reconstruction techniques are more difficult (see Image reconstruction of PET). Using statistics collected from tens of thousands of coincidence events, a set of simultaneous equations for the total activity of each parcel of tissue along many LORs can be solved by a number of techniques, and, thus, a map of radioactivities as a function of location for parcels or bits of tissue (also called voxels) can be constructed and plotted. The resulting map shows the tissues in which the molecular tracer has become concentrated, and can be interpreted by a nuclear medicine physician or radiologist in the context of the patient's diagnosis and treatment plan. PET scans are increasingly read alongside CT or magnetic resonance imaging (MRI) scans, with the combination (called "co-registration") giving both anatomic and metabolic information (i.e., what the structure is, and what it is doing biochemically). Because PET imaging is most useful in combination with anatomical imaging, such as CT, modern PET scanners are now available with integrated high-end multi-detector-row CT scanners (so-called "PET/CT"). Because the two scans can be performed in immediate sequence during the same session, with the patient not changing position between the two types of scans, the two sets of images are more-precisely registered, so that areas of abnormality on the PET imaging can be more perfectly correlated with anatomy on the CT images. This is very useful in showing detailed views of moving organs or structures with higher anatomical variation, which is more common outside the brain.